Beebe Medical Center announces that Paul J. Pernice, CPA, has been named Vice President, Finance/Chief Financial Officer. Mr. Pernice is taking over responsibilities from James W. Bartle, who has served in the same capacity for Beebe Medical Center since October 1988. Mr. Bartle announced his plans to retire last year. To allow for a smooth transition, Mr. Bartle will officially retire this summer and is expected to stay on for a period of time as a Senior Advisor to the management team and to the Board. Mr. Pernice brings more than 25 years experience in both non-profit and for-profit healthcare organizations. He is a certified public accountant and a Six Sigma Black Belt, which signifies his experience in leading efforts to find quality and cost-effective solutions to business issues. He joined Beebe Medical Center from the Center for Family Guidance Health Systems where he served as Chief Financial Officer. Previously, he served as Senior Vice President of Finance & CFO/Executive Director of Finance at the Robert Wood Johnson University Hospital Hamilton, and as Director of Finance at Virtua Health Voorhees Hospital in Voorhees, New Jersey. Mr. Pernice has a Bachelor’s of Science Degree in Business Administration from Rowan University in Glassboro, New Jersey, and a Master’s Degree in Business Administration from Saint Joseph’s University in Philadelphia. Beebe Medical Center began a national search last summer to find a successor for Mr. Bartle following his announcement that he would retire. During his tenure, Beebe Medical Center experienced tremendous growth and success. Revenues grew from $20.8 million to $254 million. Beebe Medical Center assets increased from $30.6 million to $285 million. Most notably, Mr. Bartle was responsible for managing several bond issues that helped finance the Clinical Building on Savannah Road in 1995, that supported the development of the Beebe Health Campus in 2003, and the opening of the Hudson Wing on Savannah Road in 2008. “Jim not only brought a vision for how to help the hospital grow, expand, and better serve the community, but also a fiscal discipline that has left Beebe much stronger financially than when he arrived,” Mr. Fried said. 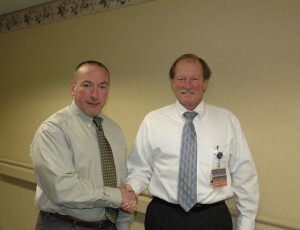 Caption: Left to right: Paul Pernice, the new Vice President, Finance, and Chief Financial Officer at Beebe Medical Center, is working with Jim Bartle, who is retiring this year. Left to right: Paul Pernice, the new Vice President, Finance, and Chief Financial Officer at Beebe Medical Center, is working with Jim Bartle, who is retiring this year.